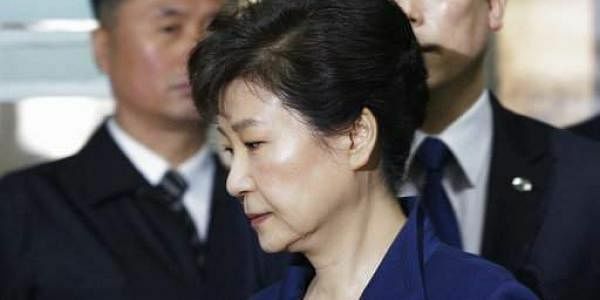 The Seoul Central District Court issued a warrant to arrest Park on charges of bribery, abuse of authority, coercion, and leaking government secrets. SEOUL: South Korea's disgraced ex-President Park Geun-hye was arrested and jailed Friday over high-profile corruption allegations that already ended her tumultuous four-year rule and prompted an election to find her successor. A convoy of vehicles, including a black sedan carrying Park, entered a detention facility near Seoul after the Seoul Central District Court granted prosecutors' request to arrest her. Many Park supporters waved national flags and shouting "president" as Park's car entered the detention facility. The Seoul court's decision marks yet another humiliating fall for Park, South Korea's first female president who was elected in 2012 amid a wave of conservative nostalgia for her late dictator father whose 18-year rule is marked by both rapid economic rise and enormous human rights abuses. Prosecutors accuse Park of colluding with a confidante to extort from big businesses, take a bribe from one of the companies and commit other wrongdoing. The allegations led millions of South Koreans to protest in the streets every weekend for months before lawmakers impeached her in December and the Constitutional Court ruled to formally remove her from office. The March 10 ruling made Park the country's first democratically elected leader to be forced from office since democracy came here in the late 1980s. Prosecutors can charge Park without arresting her. But they said they wanted to arrest her because the allegations against her are "grave" and because other suspects involved the scandal, including her confidante Choi Soo-sil, have already been arrested. The Seoul court said it decided to approve Park's arrest because of worries that she may try to destroy evidence. A day earlier, Park was questioned at a court hearing for nearly nine hours. As she left for the hearing, hundreds of her supporters, many of them elderly citizens, wept, chanted slogans and tried to block Park's car. They were pushed back by police. The women, both in their 60s, have been friends for 40 years. Park once described Choi as someone who helped her when she had "difficulties," an apparent reference to her parents' assassinations in the 1970s. Park's father, Chung-hee, was gunned down by his own intelligence chief in 1979, five years after his wife was killed in an assassination attempt that targeted him. Park Geun-hye served as first lady after her mother's death.